Direct numerical simulations (DNS) are used to study the impact of steps and gaps on laminar-turbulent transition in compressible boundary-layer flow. To reduce their influence or even delay laminar-turbulent transition, both active and passive flow control is applied. Steps and gaps are located on a flat plate without streamwise pressure gradient. Most of all, two-dimensional simulations are conducted at a Mach number of 0.6. To quantify the impact of steps and gaps on laminar-turbulent transition, N-factors are calculated. For this, steady base flows are simulated in a first step. Subsequently, Tollmien-Schlichting (TS) waves are introduced via suction and blowing at the wall, and their growth over surface imperfections is evaluated according to the eN method. 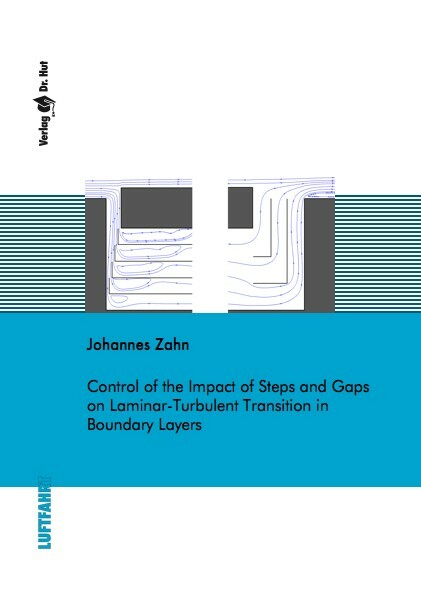 The influence of steps and gaps on laminar-turbulent transition is quantified by the difference ∆N compared with the N factor obtained for the flat plate without imperfection. One focus is on deep gaps. Due to TS-waves, a depthwise feedback mechanism occurs that is capable to trigger acoustic resonance. The mechanism is investigated for different parameters, such as gap dimensions (depth and width), gap position and Mach number. Using the mathematical description of wave superposition, a simple model is found for ∆N-estimation. Apart from investigations with TS-waves, shear-layer driven oscillations are studied in both wide and deep gaps. It is found that the gap depth significantly influences such unsteady flow. A passive flow-control method is tested for gaps in steady flows. Using the depthwise feedback mechanism and selected geometry, the N factor with gap can be reduced below the respective N of the flat plate. However, stronger flow control is needed to compensate the impact of steps on laminar-turbulent transition. As reference cases, forward-facing steps of critical heights and shapes are investigated without flow control at first. Subsequently, active boundary-layer suction is applied through a single gap in front of each step. This geometrical configuration may occur e.g. at the juncture between two surface elements on a wing of an aircraft. With suction, the impact of critical steps on laminar-turbulent transition can be compensated or even overcompensated. Additionally to active suction, a passive suction method is developed and tested as well. Compared to the smooth flat plate without suction, a significant reduction of the N factor is possible.